Many of us would like to think that we are generous and we would never admit to being greedy. Let’s face it; greed is such a distasteful word. The Bible tells us “a generous person will prosper; the person who refreshes others will also be refreshed.” (Proverbs 11: 25). I think we can measure whether we are generous or greedy. I don’t mean at times you are generous; many are. What I mean is do you hold your “stuff” loosely? Or do you hold on tight to your “stuff?” Your money, your time or even your skills and talents? Do others have to beg you for everything? My husband is a generous giver; he has always been that way. One lovely night, we were walking hand in hand, leaving a Hilton hotel heading to a 5 star restaurant when a woman came out of nowhere and walked right up to him and asked him for money for food. He did not hesitate. He just took money out of his pocket and handed it to her and we begin to walk hand in hand again to dinner. Not saying one word about what had just happened. I remember thinking that I would have never stopped and done that. Another time I was in Washington, DC with a friend on a freezing cold night. We were driving onto the off ramp, when I noticed her feverishly digging in her purse and braking as she was slowing down on the ramp; I had no idea what was happening. All of a sudden, she just stopped on the ramp and yelled “Hey, come over here and get this!” a homeless man was sitting on the railing on the ramp in the freezing cold and her goal was to feed and shelter him. Again, I was struck by her generosity. After witnessing those two acts, for some reason I changed. I stopped thinking the worst when people would stop me on the streets and ask for money or if I would see them on the corner with a sign. Instead of judging their situation, I started thanking God that He had blessed me so and I prayed for them as well as just hand them what I had in my purse. I used to be good about thinking that people should go and find a job or I would think they are going to get that money and go and drink or buy drugs. I stopped doing that. Why? Because like the two people I witnessed up close and personal, it wasn’t for me to question. I was to do what God led me to do and watch how the person I gave to was blessed; ultimately I was too. Now, I won’t say that I give to everyone; I don’t. However, I do give more than I should probably, but that’s okay, God gives me more than He should also. The one who blesses others is abundantly blessed ;those who help others are helped. 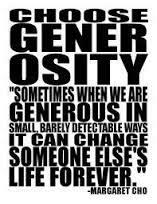 You see we all benefit from being a little more generous. Not only do we help others, we also help ourselves in that we lose a little more selfishness each time we release something that we want to tightly hold on to. In the process of developing generous habits, we become more Christ-like. We lovingly give to the poor, we take care of the elderly and orphans, and we enhance the world we live in.